Anyone who suffers from anxiety knows that it can strike out of the blue. So having quick access to advice, techniques and exercises that will help manage and overcome an attack is ideal. Fortunately, we live in the age of the smartphone app, and clever developers, therapists and healthcare professionals have realised this need and have responded to it in spades! 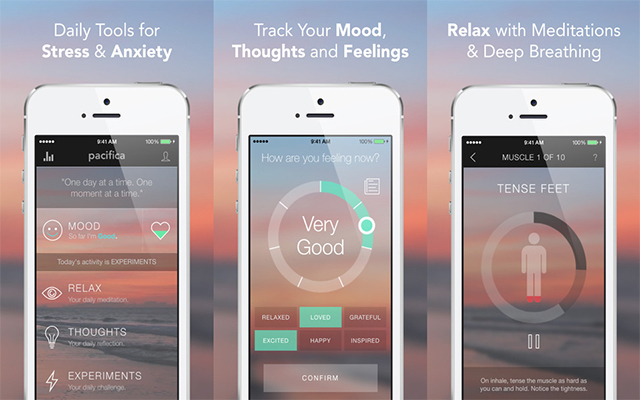 Below you will find our pick of the best apps for dealing with anxiety. SAM has been developed by psychologists at the University of West England and provides sufferers with information about anxiety and a number of effective self-help techniques to deal with attacks. 25 self-help options, including information on anxiety, thinking and anxiety, and relaxation techniques. The ability to monitor your anxiety over time. A Social Cloud feature where you can anonymously share your experiences with the SAM community, connecting you to people who are struggling with the same issues. I Can Be Free is a hypnosis program that combines soothing affirmations with relaxing music to delve deep into users’ subconscious and provide relief from anxiety. The app comes with five free audio sessions so you can try it before you buy it. After you have used the free sessions, the price per audio file is $2.99. Developed by Human Progress, the app is one of 12 within the system. 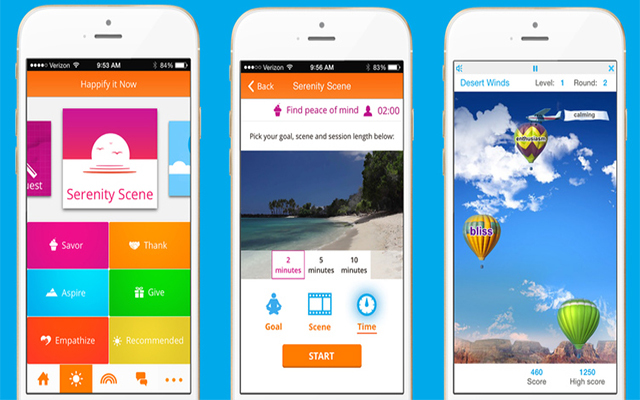 The apps are designed to deal with relaxation, sleep, overcoming fears, phobias and boosting confidence. 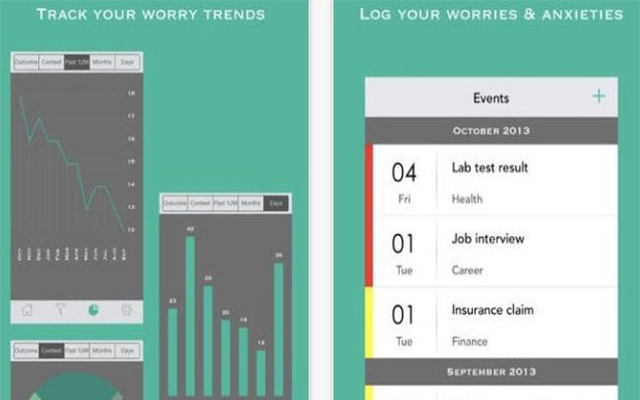 Worry Watch is a journal app which allows you to log, track and analyse your anxiety in one convenient, portable place. The Log feature lets you write down what is bothering you. With the Track feature you can set a reminder to return to your anxiety journal and see whether the outcome you imagined actually happened. The Analyse feature shows you your anxiety patterns, trends and charts. The Realise feature allows you to look back over your data and understand that in most cases, your anxiety was unfounded. Finally, the Reflect feature enables you to challenge your anxieties. The App does not need an internet connection to work, and also includes daily reminders for your wellbeing. 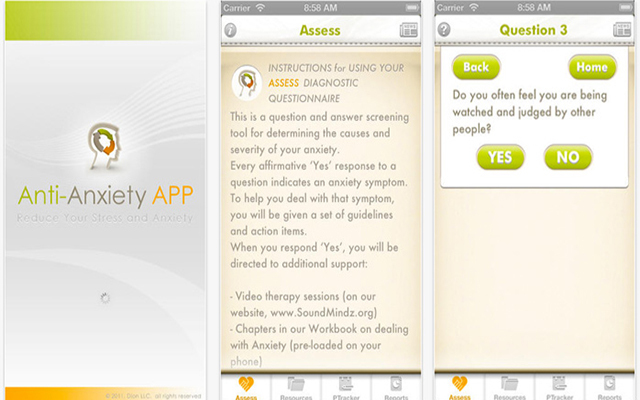 Developed by clinical psychologist Dr Arthur Ciaramicoli, this app takes users through a series of questions about their anxiety and then, based on the answers, works out a treatment plan to help overcome them. 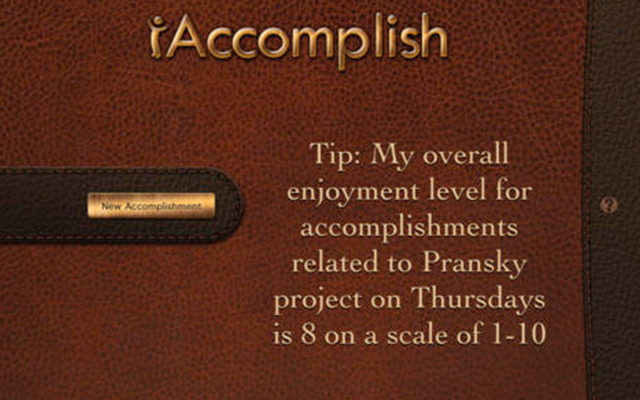 Daily journal allows users to write about their anxieties, and track their progress. 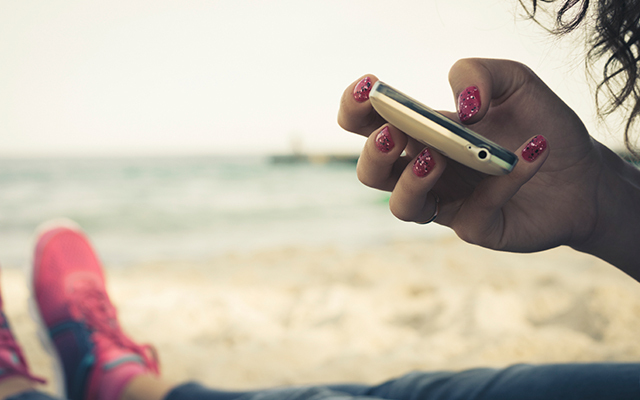 Video content educates users about anxiety and managing anxiety. 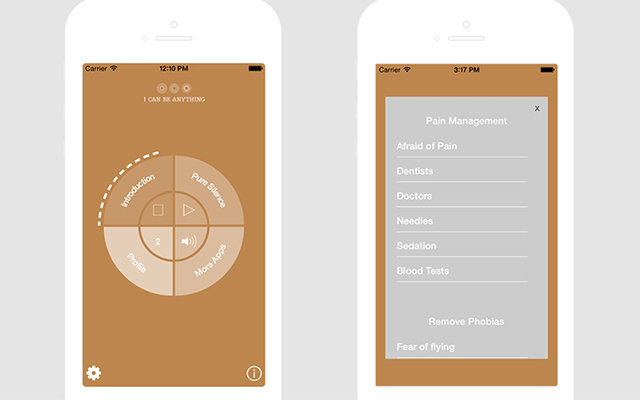 A workbook with instructions and exercises guides users through their customised treatment plan. Access to research on anxiety. Based on the principals of Cognitive Behavioural Therapy, as well as mindfulness and relaxation, Pacifica is an app designed to break the cycle of anxiety over time. Track Your Mood feature allows users to track and rate their moods throughout the day. Track Your Health lets users track their daily wellness habits like sleep, exercise, caffeine, etc. 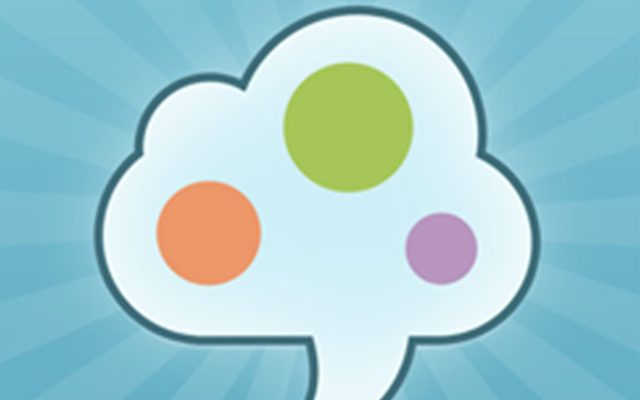 Thought Diary lets users identify and challenge unhelpful thinking patterns. With the Daily Goals feature users can tackle small goals every day. Relaxation Techniques features a number of meditations, breathing exercises and progressive muscle relaxation techniques to deal with anxiety attacks. 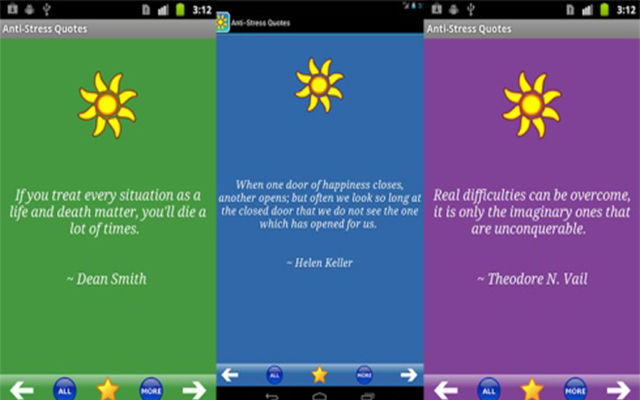 This app delivers inspirational quotes to help calm your mind. The quotes revolve around dealing with and overcoming and anxiety and stress. Users can save their favourite quotes. If you find a quote that you love, you can share it on Facebook or via SMS or email. This cool app lets you record your daily accomplishments, however large or small, to help you feel a sense of achievement, and beat the negative thoughts that whisper “you can’t”. The app lets you track every daily, weekly and monthly accomplishments. You can track what your most frequent accomplishments are, what accomplishments you enjoy the most, and where you feel most competent. You can also track where you spend most of your time and which hours or days are more productive than others. Based on the science of positive psychology, CBT and mindfulness, this app is loaded with tools and programs to help users take control of their feelings and thoughts. The games and activities can be done anywhere and don’t require a lot of time to complete. The app is about small daily steps for big changes. Packed with brain training games, activities and advice. Designed to foster positive traits like empathy and gratitude. A Diploma of Counselling from Open Colleges explores the foundations of mental health, giving you the knowledge and skills to work as a counsellor. Happify is my favourite app to deal with anxiety. I just have downloaded the latest version of this app from http://tutuhelper.co all latest paid apps are available for free on this app store. Its a very nice page with lots of amazing stuff.